As any building owner knows, it’s often well worth it to make investments that will help improve building operations and save you money in the long run. One of the biggest total lifecycle costs of a building is energy use, so an investing in ways to reduce your building’s energy consumption is a great way to reduce your future operating costs. Here are 5 energy investments you can make in your commercial building that will help improve energy performance and reduce costs. Presumably you—or your building occupants—already have a maintenance plan for your building. But I want to emphasize the specific importance of preventative maintenance for keeping your building’s mechanical systems operating in peak condition. You can’t wait for something to go wrong before executing repairs and maintenance. By that time, it may already be too late. If you don’t perform routine preventative maintenance, the energy use in your building may be compromised because of a broken or faulty system, and you won’t know until things really go wrong. Why is it important for your mechanical systems to operate at peak condition? Because that’s when they’re the most efficient. You can save energy just by optimizing your HVAC and other mechanical systems so that they’re not working too hard or losing energy. I call preventative maintenance an investment because many facilities don’t have much of a PM plan. They operate on a reactionary basis, making repairs when things go wrong. So allocating the staff and time to performing preventative maintenance is an investment, but it’s one that will pay off in the end. If your building’s controls for heating, cooling, lighting, etc. aren’t already automated, you should consider investing in building controls or an energy management system. Building controls, or building automation, includes elements like programmable thermostats that can automatically adjust the temperature (for example, keeping it cooler when there’s no one in the building to decrease energy use). Generally, building control systems incorporate a building’s mechanical, electrical, and plumbing components. Similarly, an energy management system uses a computer program to monitor, track, control, and optimize energy performance of a building. They can also perform the automation tasks described above, but with this method the building owner has the added benefit of real data and facts to help make better energy decisions. I’ve discussed the benefits of mechanical insulation numerous times on this blog. The bottom line is that mechanical insulation starts saving money and energy as soon as it is installed. Insulating pipes and pipe components is one of the most basic ways to drive energy savings for your building. And it truly is a significant savings. Here are some statistics from real U.S. companies projecting their potential savings if mechanical insulation was either installed, replaced, or repaired. If you already have a mechanical insulation system, be sure to perform regular visual inspections to be sure that it is still performing as it should. According to the National Insulation Association, between 10% and 30% of all insulation that has been installed is either missing or damaged. If you have missing or damaged pieces of insulation in your system, the original projected energy savings will fall short. Another effective energy investment you can make for your building is to upgrade the lighting. This includes using more energy-efficient light bulbs and fixtures, but it also incorporates methods to produce better lighting and make the lighting process work for overall building efficiency (because the lighting system affects heating and cooling loads and power quality). Energy-efficient lighting system designs include factors like using natural daylight whenever possible, optimizing the light source for the specific building and application, and planned maintenance and recommissioning of the system. These energy investments will ultimately help prolong the lives of your mechanical systems while saving money on energy costs. 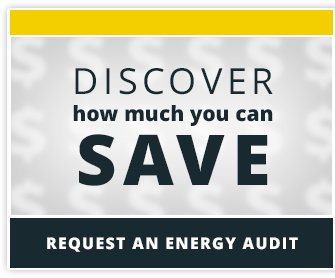 Any major upgrade to your facility is an investment, but you’ll quickly see a return when your energy costs start decreasing.